It's the National Week of Science & Technology, and there are four massive marquees taking up the role of the Zocalo. The UK is the country of honour so we have a pretty big space in one of them with an exhibition, telescopes and a 28m toy racetrack. 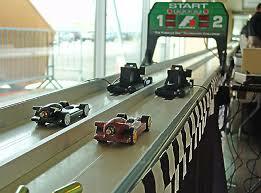 The latter is a test-track for school-designed balsa wood F1 cars powered by tiny CO2 canisters. It has an educational point: to learn about physics, aerodynamic design, manufacture, leadership, teamwork and even sponsorship (they have to raise money themselves). But the best part is testing your reactions and racing them, although it's more like a dragsters than F1. You wait, fidgety finger on a button, for the red lights to turn green and... off they shoot - stopped by nothing more sophisticated than a pillow. Science was never that fun in my day.